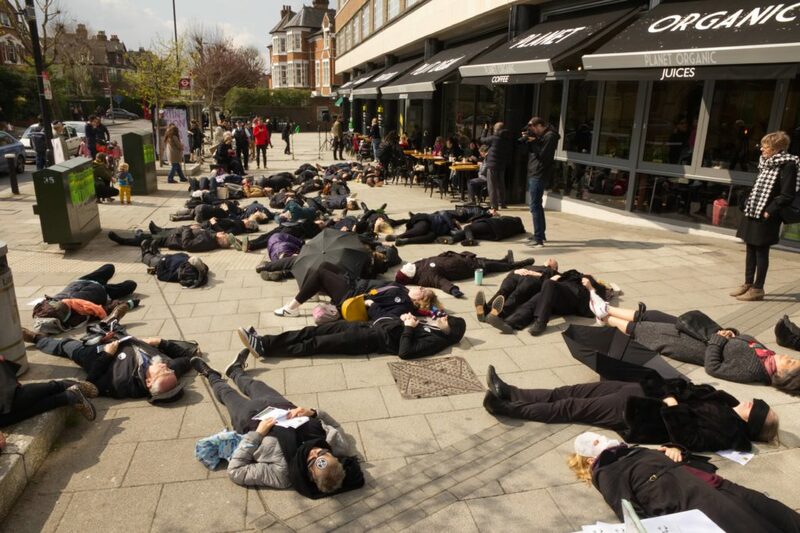 Muswell Hill Sustainability Group members and others from the Extinction Rebellion network made a stand against climate change on Saturday 13th April – by lying down! The symbolic ‘Die-In’ drew over 50 people to Muswell Hill’s St James Square to call on the Government to declare a Climate Emergency. The Die-In was accompanied by haunting original music composed by local musicians Deanna and Brian Bogdanovic of Bonafide Studios. After the die-in, there were speeches from local young people. Celia Hanna, 20, who is studying Biology at university said “through my course I’m learning about the devastating impacts of climate change on our oceans, and the urgency of cutting carbon emissions to stop irreversible change”. Safi Jenkins, 17, said “it’s up to young people to take action – we will be heard, and we will create the change we wish to see”. Later concerned people packed the British Legion hall nearby to discuss ‘Haringey in a time of Climate Emergency’, addressed by Jayne Forbes for Extinction Rebellion, Councillor Kirsten Hearn, Joe Baker (Haringey Council Carbon Management Team Manager), Alan Morton (Muswell Hill Sustainability Group) and Catherine West MP. After the Die In the hard work of making the authorities take action began – starting with Haringey. ‘Haringey in a Time of Climate Action’ was held in the British Legion hall. The corpses from the Die In were revived with delicious dhall and bread and the bar was open whilst visitors talked to local groups displaying their activities. There were general environmental groups including Sustainable Haringey, Muswell Hill Sustainability Group, Friends of the Earth and Extinction Rebellion with display tables. The need to preserve land was represented by a Vegan table, with recipes and the sale of pulses, as well as information about Wolves Lane and local allotment groups. The need to move to clean travel was represented by Living Streets, an offer to join a car club, a Haringey test drive car parked outside and an electric bicycle. The need to generate local electricity was represented by en10ergy, who had completed their community solar project at Fortismere school just this week. Additionally Parity Projects were offering free energy whole house assessments in June for a pilot project. The theme of the event was to understand the dire state of the planet and what Haringey residents can demand Haringey Council to do to follow on from declaring a Climate Emergency on 18thMarch. Firstly Jayne Forbes of Extinction Rebellion talked about the frightening signs that the earth is heading for a climate breakdown. Without urgent action, in the way that Britain pulled out all the stops to fight World War II, millions of people will die. The planet will survive, but may become uninhabitable. Cllr Kirsten Hearn then announced the direction that Haringey is taking to become a zero carbon borough much sooner that the 2050 previously expected, since declaring the climate emergency. She introduced the Haringey Low Carbon officer, Joe Baker who went though slides that covered the action areas aimed at reducing carbon in Haringey. Questions submitted by the audience, covering a wide range of topics were put to the speakers. Catherine West MP answered a question by supporting civil disobedience where justified and also gave an update on her activities to drive green policies in Parliament. The audience were encouraged to watch a video by Greta Thunberg to the UN Conference of the Parties. Greta is the 16 year old Swedish girl who is behind the school children’s strikes around the world calling for adults to stop trashing their world. Suggestions for actions that individuals could take were provided, but Extinction Rebellion was formed to take more drastic steps, so the reverse side had lobbying and activism links. The audience were assured that their questions, and comments posted on the walls would be sent to Haringey Council as the start of a citizens channel to participate in ambitious action. Saturday’s events herald Extinction Rebellion’s international week of action running 15th-21st April, launching in Parliament Square at 11am on Monday 15th April.